Manage and fulfill requests for data access, portability, and erasure. Easy-to-configure web form for your customers & website visitors. GDPR Form gathers all data subject requests, tracks their progress and streamlines the response to data subjects. Simplify and track Data Subject Access Requests. Offer Data Subjects a professional & user-friendly experience. Ability to tailor a branded web form - Trust starts with brand identity. 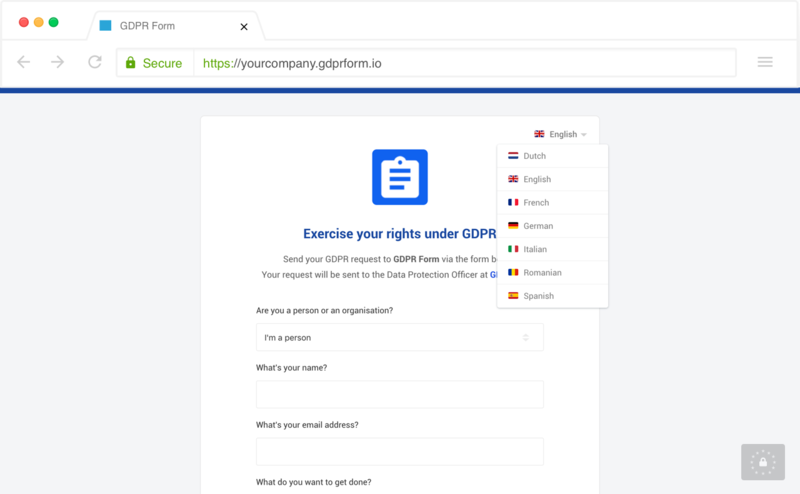 You can customize the look & logo for your GDPR Form. Notify data subjects instantly with our smart auto-responders in your e-mail. Don't waste time on manual work. Monitor all open requests from one overview and assign the right users to fullfill the requests within the required deadline. We offer a weekly digest to help you prioritize requests. We will help you stay within the required deadlines. Nobody wants to miss a deadline. Stay on top of what's happening, receive notifications via email, SMS or Slack. Ready to use. Easy to set up. Make subject requests clear and straightforward. 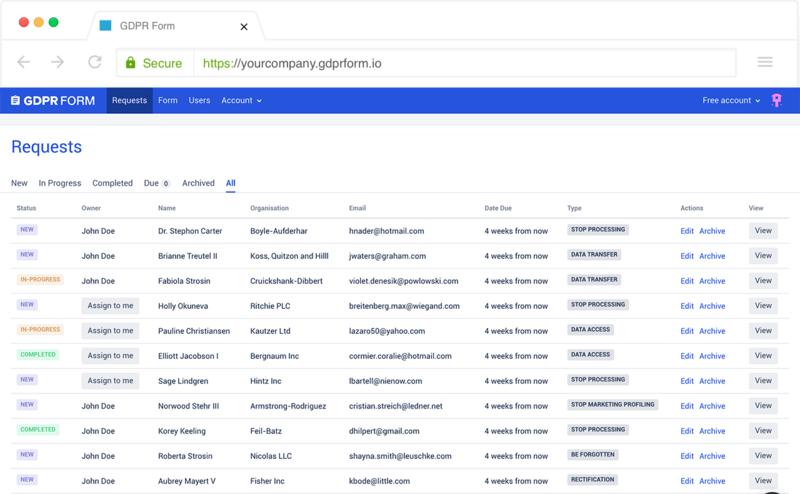 Configure your GDPR Form in minutes. Live in a click! Assign and track all requests from a central dashboard. Monitor priorities and automate responses to data subjects. We keep track of the latest changes in privacy laws so you don't have to. Helping you stay compliant. Gain trust through transparent communication on our form and auto-responses that keep subjects up-to-date. What about the GDPR data subject access rights? The GDPR took effect on 25 May 2018, and outlines distinct data subject rights for EU customers and employees. Find a plan that is right for your business. We won't spam you. Your e-mailaddress will only be used for our newsletter. © 2019 GDPR Form. All rights reserved.